For me nothing symbolizes the historic trappings of privilege, institutional and economic power than somewhere like Chatsworth. A whopper of a stately home set in truly spectacular gardens, visited by droves of onlookers paying homage to the relic splendour of the English nobility. If we accept that ‘high’ culture is a product of this power then the visual arts as a subject, are by extension also largely born of it. With this in mind it is mind boggling how the refreshing notions of the subversive and the anti establishment position ever got adopted by artists in the first place. Particularly as it is belief in this agency to effect change that got many of us hooked on art in the first place. However if it is to have any real value then subversion needs to effect actual change. Thinking about my lifetime to date, nothing changed the way we think about art, form and narrative more profoundly than the modernist project and the counter thinking it subsequently spawned. And as such Anthony Caro can be viewed as one of the key formal subversives of recent history. Figurative art has always had a ‘safe’ home in such stately surroundings. So despite his unquestionable position as a big hitter on the international sculpture scene, I was curious to see both the relationship of this 20th century abstraction set against the very ornamentation modernism rejected and how it fared against the dwarfing qualities of big landscape and even bigger sky. On the grounds of the first question, as with the making of the work itself, placement is everything. Caro as a sculptor has persistently shown his mastery of form and materials by doing so much with so little. When you look at any one of his arrangements of sheet steel and bar forms, things always feel instinctively in the right place. I find myself visualizing the re-configuration the composite parts, only to quickly realise that Caro’s gut drive to place that thing on top of that other thing and at that particular angle is highly attuned, deceptively simple and bang on the money. Concerning their placement against the house and grounds the sculptures do not attempt to compete, so much as frame and offer a syntactical opposite. 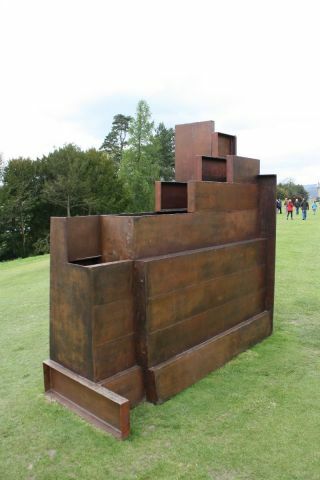 The largest piece ‘Goodwood steps’(1994-96) stretches across the width of the long rectangular Canal pond and frames the distant house and gilt rectangular windows with a counterpoint of industrial steel step forms. This contrast between the artwork as a thing in itself and the laden ornamental references of the house stands as a singularly succinct visual essay in the bridge between modernism and the post modern, where the best aspects of formal autonomy acknowledge their sense of being in the world. Of being both a thing in itself, but also a thing in dialogue. The most recent work on show ‘Egyptian’ 1999-2001 a modest sized, sensual rusty rectangular form, is clear evidence that as an artist, Caro then at age 77 was still evolving and not letting his significant contribution limit his ever forward looking outlook. It suggests architectural connotations but resolutely rejects illustration. It is sensual evocative and bewitching. This dialogue with the world is helped in no small way by Caro’s use of negative space. This is a hallmark feature of Caro where the spaces in between are every bit as essential an ingredient in the work as the metal itself. It is this use of the gap, the hole or the slit that allows the thing to be in the landscape. Which answers my second line of enquiry. Like all sculpture put in the great outdoors there can be a distance of only a few hundred metres were the transition from the monumental to the minor takes place. But the job in hand for the art to do is to always beckon your closer, make eye contact and create the desire necessary to both go and see and then to linger. The sculptures on show managed to draw me in and despite the chilling Siberian wind encouraged me to stay a good while. I stayed because the closeness was thoroughly rewarded by enjoyable engagement with the form, materials and texture, which combine to engender a curious mix of gravitas through post industrial referents and a uplifting powerful sense of ‘joie de vivre’. These are forms at play in the world, and I felt all the better for seeing them up close and personal. Despite their different philosophical departure points to their place they were paradoxically at ease with their surroundings. Indeed in this these articulations of forms work very well both despite and because of the well coiffed gardens. The worst thing for me would have been their assimilation into invisible ornamentation. The job of art for me to bring something else to the table and here at Chatsworth a rare thing occurs, something well established yet remarkably still fresh and invigorating.